It’s peach season in New York and I decided to take advantage of this time and create the ultimate peach recipe! Peaches don’t only taste amazing but they are packed with antioxidants, such as Vitamin A, C and E. They are also said to make you feel full longer, making them the perfect breakfast fruit. Eating local and in season peaches are beneficial because they retain a higher nutritional value than peaches that are out of season that have been stored for long periods of time during transportation. Now is the time to head to your farmers market or grocer and enjoy fresh juicy peaches! The best part of this recipe is it can all be made on the stove top! Because who wants to use their oven in the summertime? Sugar free and grain free! Place the peaches, cinnamon, vanilla, and 2 tbsp of water in a medium pan. Bring to a soft simmer and gently stir occasionaly. Allow to simmer for 8-10 minutes or until fruit is tender. Set aside. Begin the nut crumble, pulse the Brazil nuts, almonds, and pepitas in a food processor until nuts are coarsely chopped but still on the small side. Combine the nut mixture with the shredded coconut, cinnamon, cardamom, a pinch of sea salt, and melted coconut oil. Add the nut mixture to a pan over medium heat. Allow the nuts to toast until golden, about 3 minutes, stirring occasionaly. Remove from heat and stir in the dates. 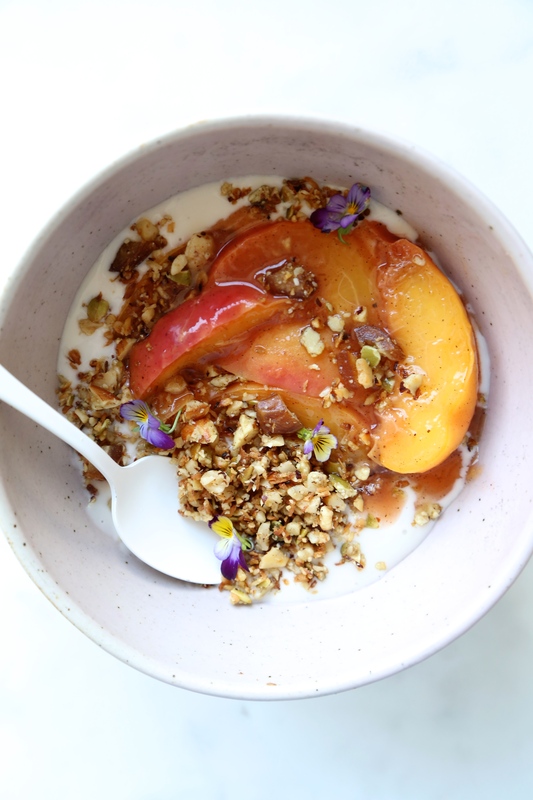 To serve, top your favourite yogurt with warm or cold peaches and nut crumble. Peaches can be stored in the fridge in an airtight container for 3 days. The nut crumble can last up to a year in the fridge. This entry was posted in Breakfast and tagged gluten-free, grain-free, local, peaches, seasonal, Vegan. Bookmark the permalink.